I once posted a great tip for fabric stashing. See it here. 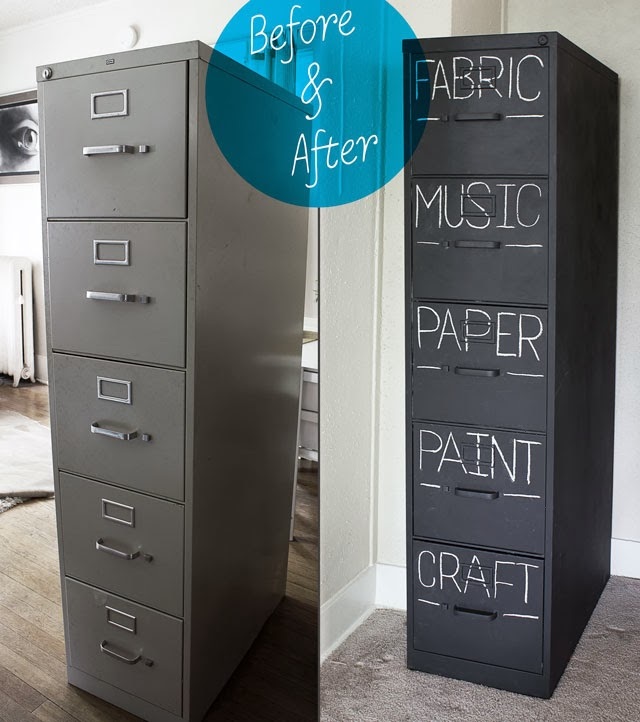 Paint an old filing cabinet and using the folders to drape your fabric over. Not only can you immediately see and access your fabric but it's so tightly packed that you can fit a lot more than a closet. I saw this via Mox and Fodder. Paint your filing cabinet with black chalkboard paint then label the drawers with chalk or decorate however you like. neat idea! I live in an apartment, so space is very limited. A little over a year or so ago, my friend Karma (a quilter) decided to do this with her smaller pieces of fabric. And she has a lot of fabric. I helped her for several days. And then several more a week or so later, plus her daughter helped her too. We filled an entire file cabinet like the one shown; plus at least 5 or 6 or the plastic milk crate file boxes. It took forever!!! But we got it all done. We didn't paint the file cabinet... (probably should have done) because she wanted to "get at it" right away. But now, it's so easy to find things. We filed in solid colors, color groups, etc... and it turned out great. Oh, one thing we did different; we cut the file folders in half at the fold making twice as many folders as we got (she got her's at Sam's club)originally. She is happy. Thank you! As a professional dressmaker working from a small studio in a small home, you can imagine the problems I have with storage. This is an awesome idea! It would go with the metal freestanding wardrobe I already use with metal skirt hangers holding the folded fabrics and could house some other bits and pieces too.